It is an unfortunate reality that some business travellers encounter unclean accommodation. While the brochures and online advertisements might make apartments look pristine, they can often be disguising the fact that their accommodation suffers from unclean bedding, germs, stains and unidentified odours. If you have experienced this before, you will know just how unsettling it can be to encounter this after a long day’s work or travelling. Research the venue – make sure you read a variety of reviews on sites, such as Trip Advisor, both positive and reviews offering constructive criticism so you can see what has been written about them. Give the serviced apartments a call to ask them questions regarding their sanitising practices. If they are happy to answer your questions and readily have answers, they are probably more true to their word than those who skirt around the issue. Make an assessment on arrival – if the entrance of the building is unclean and messy, chances are your room will be too. When you enter your room, quickly scan for cleanliness. You can also pull back the sheets and check for red and black spots on the linen which can be indicative of bed bugs. Be vocal about your unhappiness – if your room is not up to the cleanliness standards you had in mind, speak to management about it and ensure they send a cleaner to rectify the issue. It is more productive to make your complaints known to the serviced apartments on arrival than to just write poor reviews about it once you have left. This will help them to make the necessary improvements. Be proactive about cleanliness – there will always be areas where dirt can collect or be missed during regular cleaning routines of the cleaners. Pack some disinfectant wipes or sprays and simply give your room a spray to stop the spread of potential germs. 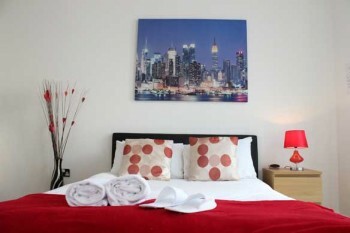 At Cotels we present a variety of clean and hygienic serviced apartments to the market. Each of the apartments we represent is thoroughly cleaned. We offer a weekly maid service to ensure your apartment is spick and span, plus your luxury towels and linen are replaced weekly. Other reasons to book your stay at one of our serviced apartments in Milton Keynes includes the fact that broadband, satellite and safe parking are included in the rental rate. We also make sure each apartment is furnished with comfortable, contemporary and modern items. To learn more about our clean serviced apartments in Milton Keynes and other areas, take the time to contact us at Cotels today.